I haven't read many darker contemporary books, but when I was looking to read an emotional, powerful story, I turned to Don't Breathe a Word. And I was not disappointed. This book is not for the faint of heart, but if you can read past the heartbreaking moments and the grim reality that what is portrayed here is life for some teens, you will be left with a truly poignant story. Where do I even begin to talk about this book? I am amazed that Holly Cupala could write this story to be heavy, intense, and yet not completely depressing. She doesn't shy away from any issues that kids on the streets (or teens in general) face, but a book like this needs the gritty truth rather than a glossing over of these unpleasant aspects. It's impossible not to be drawn into the world that Cupala has set up for these teens and to hope that they all do find a way to survive (preferably off the streets). At the same time, the relationships they forged, the family they created themselves, was incredibly touching. The fact that these teens who seem to have seen little true love in their life are capable of loving and taking care of themselves and others is inspiring to see. The four main characters in this book - Joy, Creed, May, and Santos - all have their own story and their own secrets to tell, and learning about all of their secrets and how they'd had to deal with them was nothing short of heartbreaking. I cared for each of them and I hope that, even though the story is over, they all continue to find their way. Surprisingly, the character who bothered me the most in this story was Joy. Even though we learn the most about her story through flashbacks, I wasn't quite as moved by her story as by the others. However, I did appreciate that her time on the streets helped her to grow into a stronger person. Despite my issues with Joy, this book is worth reading for the stories of all the characters, especially Creed, and for insight into lives that most of us cannot even begin to imagine. Don't Breathe a Word has both a story and characters that will draw you in and not let you go. It is not an easy read, but it is certainly a good one. I will look forward to reading more from Holly Cupala! I read Tell Me a Secret and OMG it made me cry! 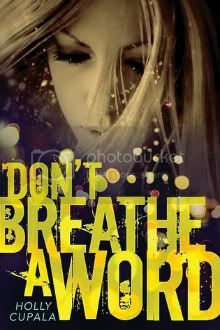 I can't wait to read DON'T BREATHE A WORD. Great review! This sounds pretty intense. I am always needing a change of pace from my usuals. This sounds great.